Easily reached within a relatively short drive from NSW capital Sydney, the Hunter Valley is the state’s signature wine region, and draws both day trippers from nearby destinations as well as serving as a travel drawcard in its own right. With its combination of an extensive array of high-quality wineries coupling with typically verdant, rolling scenery to make for a relaxing getaway. Indulging the palate truly comes to the forefront with a visit to the Hunter, and as a result, many of its top experiences are oriented around food and wine, as well as a robust events calendar in support of showcasing both of these. The Hunter Valley is far from the adventure-oriented, adrenaline pumping destination, instead it is a region that’s devoted to the finer things in life, such as roaring log fires, quaint B&B’s, serene sightseeing and, of course, delicous wine. 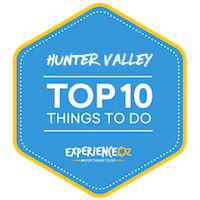 For those planning to visit one of Australia’s most popular day trip spots, we take a look at 10 of the top things to do in the Hunter Valley in detail here. Making for one of the more refreshing breaks from the typical winery offerings of the Hunter Valley, this outstanding collection of diverse, themed gardens is one of the signature attractions of regional New South Wales. Set out over an area of an expansive 60 acres (making them the largest of their kind in Australia), the Hunter Valley Gardens are a diverse showcase of botanic beauty with motifs that run the gamut from the Oriental to the European to the tropical and everywhere in between. Featuring 10 different gardens, each with its own perfectly-manicured theme, the amount of thought and attention that has gone into both their creation and upkeep is staggering – few other places make the simple act of wandering around so beautiful. The integration of water is done particularly well here, with its various lakes and ponds adding an extra sense of serenity and variety to the landscape.Particularly striking is the way the passage of the seasons completely changes the gardens’ atmosphere. The transition makes multiple visits at different periods throughout the year worthwhile, particularly during both spring when the blooms are out in full force and the likes of the Rose Garden truly shines, and autumn when the deciduous trees add an additional dash of colour to the already impressive palette. While visiting a garden may not initially seem like the most family-friendly of things to do in the Hunter Valley, Hunter Valley Gardens is instead an attraction that can appeal to all ages. Children will also love it here, particularly the Storybook Garden which contains a number of wonderfully crafted statues and figures straight out of some renowned fairytales. The attraction isn’t merely only a garden, either, as Hunter Valley Gardens also offers visitors a number of charming boutique shops staffed by exceptionally friendly storekeepers that make for wonderful places to buy gifts and souvenirs that are truly unique. Add in a high-quality restaurant that grants not only delicious food but combines it with lovely garden views, and you’ve got a comprehensive overall attraction that’s well worth the price of admission. Visitors to Hunter Valley Gardens can typically expect to spend around 1.5 to 2 hours walking around its gardens on average, which can be drawn out further if taking time to enjoy some food, browse its range of chocolates, fudges, wines and honeys, and relax with a meal while soaking in the tranquility of it all. There’s also a lovely train ride on offer that takes visitors on a pleasant and informative tour of all the gardens highlights, which can help save your legs while providing additional insight into all the floral goings-on. The ideal complement to an otherwise wine-oriented visit, Hunter Valley Gardens make for an essential visit for first-timers to the region. The Hunter Valley simply wouldn’t be the Hunter Valley without its diverse array of wine offerings, with it serving as the obvious main drawcard to the region for the majority of visitors from afar. As a result, most will want to visit at least one winery during their time in the Hunter, if not several; there’s over 150 from which to choose, and finding your own preferred mixture of setting, vintage and flavour is one of the most appealing parts of a trip here. Sampling all of those quality wines can soon add up from an alcoholic consumption perspective, however, and as a result tours and guided day trips have become an immensely popular way to experience some of the best of Hunter’s cellar doors without having to monitor your intake. Visitors to the Hunter Valley will thus be spoiled for choice when looking to embark on such a trip, as multiple tour operators have sprung up over the years, each offering a number of different itineraries and covering a different spectrum of some of the region’s most essential wineries. Each tour’s focus differs enough to make for a schedule that caters to individual tastes – some are oriented around providing boutique experiences at smaller and more hidden cellar doors, whilst others visit some of the big names such as De Bortoli, Bimbadgen, Scarborough, Tyrrell’s, and the aforementioned Audrey Wilkinson Wines among others. Combine this with a choice of pickup points/departure locations – Hunter Valley tours typically either set out from Sydney for a full-day trip or from within the Hunter Valley itself – and there’s a dizzying array of potential tours available to kick back and enjoy. Those looking for winery tours that head out from the Hunter can join Two Fat Blokes Tours for a number of different experiences that typically also put a heavy focus on enjoying some of the delicious food the region has to offer. Participants here can sample not only the wines themselves, but a number of appropriately-paired cheeses to go along with each, as well as chocolate tastings and the option for a solidly enjoyable degustation lunch as well. With added pickups from Hunter Valley accommodation, it’s very much an all-inclusive experience for those already in the Hunter. Travellers wanting to depart from Sydney, meanwhile, also have various choices; the likes of Hunter Valley Wine Tasting Tours, Zephyr Tours and Boutique Tours Australia both provide daily trips from the NSW capital, with options for trips that either include or exclude lunch, depending on your preference. These are ideal for those willing to commit a half or full day to the touring experience, and can work out to be more economically viable when the price of accommodation for an overnight stay in the Hunter is factored in. Guided tours ensure that you’ll visit some of the top spots without having to be overwhelmed with choice, and come with added extras such as behind-the-scenes VIP tastings, some detailed commentary, and other little touches that help enhance a visit to what is already a delightful region. If one ever needed an additional reason to keep on the straight and narrow path and continue to avoid partaking in criminal activity, a visit to the Hunter Valley’s Maitland Gaol will provide all the incentive needed to do so. The historic prison encompasses over 150 years’ worth of criminal history and offers some harrowing insight into the often harsh conditions that its inmates were exposed to throughout the duration of its operation, which ceased relatively recently in the 1990’s. The gaol complex itself is divided up into old and new sections and emanates an instantly eerie atmosphere than only intensifies upon further learning about its many historic occurrences and happenings involving prisoner and warden alike. Visitors to the Gaol can take part in a variety of tours to soak in its tumultuous history – which come in both accompanied and self-guided form – while there are also options designed to cater specifically to children as well. The main tours available to the public cover a range of different themes, each of which emphasises a different aspect of the prison’s past ranging from escape attempts to the inmates’ daily lives, while the self-guided audio tour is ideal for those looking to roam around and explore at their own pace. Participants are provided with a loaned iPod (or your own device) along with a headset and can make their way around the facility with commentary that details points and stories of interest while helping to set the ominous scene of what you’ll encounter along the way. Especially spooky is the pitch-blackness of the condemned cells; even when visiting during the day it’s hard not to have the hairs on the back of your neck stand on end upon entering their inky nothingness. Especially spooky is the pitch-blackness of the condemned cells; even when visiting during the day it’s hard not to have the hairs on the back of your neck stand on end upon entering their inky nothingness. In many ways, it’s an eye-opening experience that makes it hard to believe that criminals were incarcerated here as recently as 20 years ago. Maitland Gaol was homed to numerous notorious criminals throughout its history including the likes of infamous “backpacker murderer” Ivan Milat, and their tales are brought to life on the guided tours by excellent guides that can share numerous fascinating stories. Topics of these cover everything from former prisoners and their smuggling of weapons inside the gaol, the challenges wardens and gaol staff faced on a daily basis, and the structure of the building itself covering every section from the showers to the infirmary. The especially daring visitor can even opt for an overnight “sleepover” experience that intensifies the already heavy atmosphere once the sun goes down! Tours here are reasonably-priced given the significance of the attraction and the level of insight provided, and you’ll likely come away from each with a whole new level of appreciation for what from the outside looks like a relatively unassuming historic regional building. Allocate around 2 hours to complete a visit here if visiting during the day, or a little more if you’re visiting around meal time as the Gaol is also home to an excellent cafe that serves high-quality food that’s well worth refreshing oneself with. Hot air ballooning is an inherently tranquil activity in and of itself, but blend it with the rolling and verdant scenery of the Hunter Valley region, and you’ve got a venue that’s conducive to a picturesque aerial adventure. The valley’s rolling hills and expansive vineyards form an idyllic backdrop to the serenity of floating peacefully through the air at several thousand feet. As the sunrise casts its glow over the regions of Pokolbin, Lovedale and Rothbury below, you’ll be presented with outstanding photo opportunities that only the combination of altitude, smoothness and uninhibited views of ballooning can offer. Those looking to take a scenic aerial adventure will be spoiled for choice in the Hunter, with operators such as Wine Country Ballooning offering quality experiences for individuals and groups alike. While it’s an experience that may seem to run counter to most people’s leisurely aims in visiting the Hunter Valley given the early rising time required, seeing the landscape dappled in the light of the early morning sun is well worth the bleary eyes. It’s especially magical to see multiple other balloons dotting the air at the same time – a commonplace sight in the early morning Hunter Valley skies. The balloon inflation process before launch is something to behold in and of itself, too, as this crumpled up a bit of canvas is filled via flame and gradually expands into a method of transportation able to carry up to 16 people in a basket. During balloon flights, all the essential sights, landmarks and other points of significance passing below are explained in detail, which can serve as a great way to gain your bearings for further exploration of highlights in the region. Balloon flights with these duos of companies come with staff that convey a calm and reassuring attitude to help alleviate the fears of those who may be afraid of heights, allowing you to simply enjoy the tranquil floating and admire the landscape below. Flights are typically capped off with a delightful breakfast, too, with Wine Country Ballooning offering a taste champagne option to go with the flight as well. As one of the Hunter’s most iconic experiences, no trip here would be complete without rising early and hitting the skies for a hot air balloon adventure. One of the country’s most extensive displays of Australian wartime memorabilia – as well as an excellent tribute to our dedicated service people – the Australian Army Infantry Museum in the military barracks of Singleton allows visitors to immerse themselves in the often trying trials of those who have participated in wartime conflicts throughout our country’s history. Featuring an incredible array of weapons, uniforms and various other artefacts from infantry branches of the military services, the museum is surprisingly impressive in terms of both its size and extent of its contents while also offering an educational way for adults and kids alike to gain further insight into our involvement in past wars. Items and documentation here date all the way back to the periods before Australian federation, with an obvious emphasis on the infantry in particular and one of the country’s widest arrays of soldier-related memorabilia. Conflicts such as Gallipoli, Kokoda and various other significant events are all covered here, and range in scope up to present-day involvement in Afghanistan and other global hotspots. The Australian Army Infantry Museum is staffed by extremely passionate and knowledgeable volunteers who are always both eager and willing to provide additional context to each of the museum’s exhibits; it’s a warm and welcoming atmosphere in which to educate oneself about what is often a moving subject matter. One of the highlights is a particularly in-depth exhibit devoted to covering the Papua New Guinea conflict all displayed in a modern and accessible manner, with the museum having undergone recent renovations to help bring it up to date. Split into two separate levels – the bottom of which contains displays divided up by time period, while the top floor houses the majority of military weapons – there’s plenty to explore here, with perhaps its most obvious feature being the full-sized helicopter suspended from the ceiling in the centre of everything! Very reasonably-priced given how extensive it is, the AAIM is well worth a visit for history and culture buffs either in or visiting the Hunter Valley region. While it’s obviously the wine that draws most people to any individual cellar door, there’s something to be said in the overall package in which it comes wrapped and it’s in this sense that Audrey Wilkinson Wines is nothing short of a premium overall offering. One of the Hunter Valley’s – and Australia’s – oldest vineyards, it’s a historic venue with a strong and consistent legacy of quality winemaking, coupling wonderful wines that are hard to beat with gorgeous scenery to form an incredibly satisfying overall experience. There’s a general aura of romance that Audrey Wilkinson Wines’ Hunter Valley cellar door emanates, with its spectacular views forming the ideal backdrop for soaking in a sunset while enjoying a drop of quality vino. Should you time your visit here to coincide with the early evening, you’ll be able to relax on the outdoor deck atop a hill, grab a cheese platter and soak in a truly magical panorama that serves as an excellent capper to any day worth of Hunter exploration; be sure to bring a camera along for the ride. Of course, the wine itself on offer here is no second-fiddle; there are 30-some wines from which to choose here running the gamut of core varieties, with the Moscato, in particular, a standout and a reflection of the separation between what comprises a good and a great wine. Wine tastings here come with an additional layer of personal attention, with the process, history and procedure explained in an informative and entertaining manner, and you’ll have the chance to sample a number of excellent varieties throughout. Audrey Wilkinson’s main building is beautiful as well, boasting a strong European feel appropriate of the vineyard’s heritage, while also providing visitors with a lovely focal point to the pristine vineyard environment. There’s even an interesting and well laid-out museum here, too, which further documents the history of its founding family with a number of items of memorabilia as well as video to provide further context. While Audrey Wilkinson Wines is slightly out of the way of the Pokolbin central wine area, it’s more than worth the diversion, as there are few panoramas that can match is sweeping, 360° offerings while providing an overall standout experience from arrival, to sampling, to departure. The Hunter Valley has long been a getaway destination for romantic and special occasions – it’s possibly NSW’s most popular region for the likes of anniversaries, engagements and other such cosy affairs – and as such a number of its main experiences tie in well to this kind of one-off celebration. One of the chief among these is scenic flights, which offer an alternative way to view the region’s verdant landscape coupled with a dose of exclusivity and a certain “rockstar” type feel to boot – swooping your way down onto the grassed landing areas of wineries is something that feels like only CEOs should typically experience. The Hunter Valley region’s chief answer to this is Slattery Helicopter Charters, who offer flight itineraries that range from short multi-minute taster flights all the way up to more extravagant, 1.5 hour-long aerial adventures over both the Hunter as well as further afield. Flight are available as both standalone experiences themselves or extended affairs that can integrate the likes of lunches and tastings as well, making them ideal for couples in particular. It’s the extra touches that make such an experience special, such as the ability to be picked up and whisked into the air directly from your yard if living locally, or from your Hunter Valley accommodation if staying here from afar. In many ways, the gorgeous field-and-valley scenery on offer is only one part of the highlights, as is visiting the likes of the renowned Ivanhoe Vineyard where champagne delivered – quite literally – on a silver platter awaits. Flights here are staffed by experienced, informative and highly personable pilots that take time to provide in-depth descriptions of multiple points of interest along the way, and are a wealth of local information that first-time visitors to the Hunter Valley are sure to appreciate. Extra care is given to reassure those not too keen on heights, with in-depth run-throughs of safety procedures and other alleviating factors given before take off, all delivered with a solid sense of humour that’s never condescending. Both wine and beer tastings are potentially on the cards here for those travelling later in the day, while breakfast options make for an amazing way to start the day, too; itineraries can be customised to cover other select vineyards upon request, and nothing ever feels rushed or pressured to leave, either. Add in the ability to choose from a range of restaurants and you’ve got a flexible – and highly memorable – way to take in the best of the Hunter from one of its best possible angles. While the price makes it an experience that can’t be done particularly regularly for the average traveller, Slattery’s pricing is highly competitive compared to popular scenic flights in other locales throughout Australia. So if you’re looking to ring in any kind of special occasion in NSW, it’s an experience that makes for an ideal fit. Those first-time visitors to the Hunter Valley who are unsure how to determine which individual winery is best suited to them would be well served by first stopping by this lovely amalgamation of winemakers both large and small. The Small Winemakers Centre is a combination of multiple wineries all in one central location, the sum of which provides visitors with the chance to sample the Hunter’s largest array of wines without having to travel further afield. This concentration of quality producers in a single spot thus makes it an ideal point of visitation for those travelling to the Hunter Valley while short on time, while also serving as an excellent way for some talented, smaller winemakers to showcase their craft. As a result, there’s an excellent variety of both reds and whites to choose from at the Small Winemakers Centre to suit a range of different palates, with over 50 wines in total to sample – many of which have won numerous awards to boot. Guests can enter the tasting room to try their hand at a diverse range of labels, and there’s also the opportunity to take part in a “blind tasting” for those looking to put their tastebuds – and wine recognition skills – to the test. Comparing each wine and vintage side by side is a major part of the fun of attending here, which grants an extra hint of emphasis on each individual winemaker’s unique style. The layout of the attraction itself boasts more of a modern feel as opposed to that of the typically rustic cellar door, with decor that’s slightly industrial yet still chic, and its Icon Lounge is a great way to sample some quality local cheeses to accompany the wines – all while enjoying some sweeping vineyard views. A special mention must go to the staff of the Small Winemakers Centre, who are incredibly knowledgeable without ever being pretentious; there’s never a sense of feeling rushed here. Their wonderfully accommodating nature goes a long way to wanting to extend the experience while providing extra insight into what makes each winemaker tick. Open every day of the week, the Small Winemakers Centre is an excellent overall introduction to what the Hunter Valley’s vineyards have to offer before venturing further afield for more delights to follow. The Hunter Valley is something of a hotspot for golfing enthusiasts, with a number of quality courses all calling the region home, however few can compare with the prestige feel and seamless integration into the Hunter Valley’s environment that Greg Norman-designed The Vintage offers. It’s obvious that an effort has been made to capitalise on the inherent beauty of the mountain-and-vineyard setting, which is augmented by a course that comes with some great variation in both hole construction and layout. While The Vintage comes with an upmarket price tag, it brings along with it an upmarket feel as well in terms of attention to detail – both in terms of course quality and additional clubhouse and amenity-style frills. The course itself is challenging (particularly for the novice) without being overly so, with water hazards integrated appropriately without going overboard, while it’s also well-bunkered and boasts large greens with a reasonable amount of break in them. Condition-wise the course is in fantastic condition – one of the reasons it’s ranked amongst the best in the country – clocking in at a respectable Par 71 with a number of birdies available should you play your cards (and clubs) right. Fairways are likewise perfect, in good quality overall and exceptionally wide and make initial hits more forgiving. The course itself is quite long overall and thus carts are something of a necessity, however, the variation in holes means that the rather extended play time never becomes stale. The atmosphere of The Vintage is rounded out by its overall first-class facilities and clubhouse that is a veritable attraction in and of itself, offering not only an excellent pro shop manned by friendly staff but serving as an idyllic location to enjoy a meal either before or after teeing off. The Legends Grill, in particular, is a great way to recharge after enjoying a round, boasting a robust premium menu and the chance to sample some wonderful trademark Hunter Valley wines. If you’re after a top round of golf in the Hunter and willing to pay a little more for the privilege, The Vintage checks all the requisite boxes for the more experienced golfer in particular. Not to be confused with its similarly-titled brother down south in Tasmania, the Hunter Valley’s Lake St. Clair is far from an alpine environment and instead serves as one of the region’s premier picnic spots. The lake lies around 30 minutes drive from the town of Singleton, and has long served as a go-to place for locals as a hotspot for various outdoor activities including camping, sailing, boating, waterskiing and various other leisurely pursuits. Lake St. Clair’s waters contrast wonderfully with the verdant green of the Hunter countryside to make for a scenic panorama, bringing along with it an ample grassed area replete with plenty of shade – an idyllic spot in which to lay down a rug and enjoy some of that locally-purchased Hunter Valley produce. It’s a tranquil spot from which to simply relax and take in views of this rolling countryside, while the more active traveller can engage in a number of bushwalks available nearby. It’s not uncommon to come face to face with some of the many kinds of local wildlife that inhabit the region here, either, particularly during night time: possums, in particular, can frequently be spotted on an evening. Those with pets can also enjoy time at the lake as its surrounded area is dog-friendly, while fishing enthusiasts can likewise find entertainment to be had ere as it’s renowned for offering quality catches of Bass and Perch alike. Lastly, the lake is well set up for aspiring campers, with facilities such as hot showers, toilets and powered campsites all available for use, with public barbecues the cherry on top. If you’re looking for a temporary respite from the wine-oriented experiences the Hunter offers, Lake St. Clair and surrounds are an ideal diversion – and one that can be enjoyed entirely for free.